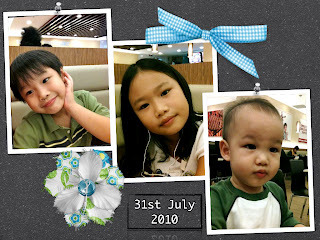 Just a few pics of my little ones that was taken today when we were out. Today was a kiddy rides day for my babies. Love this pic of Beanie wearing sunglass, he looks so cool! 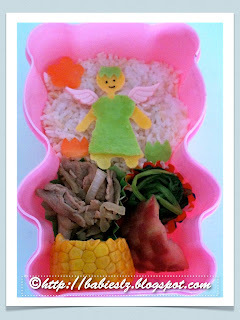 In the box: Rice, beef with onion, spinach, waterapple and corn. How come my angel doesn't look like an angel? My girl thinks it is coz of the wings. Hehe.. I was too lazy to search for pics of the angel and hence, come out with my own version using the egg sheets that I still have. 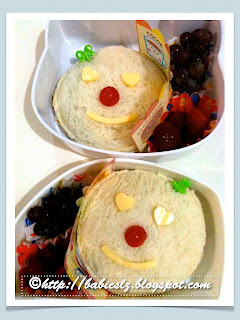 And I was trying to make the bento looked more colourful. 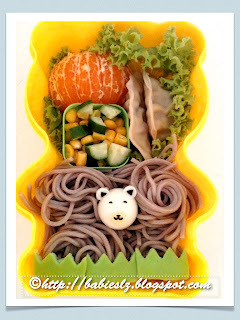 My 老二 requested to have soba for his bento. I used green colored egg sheet for the 'grass'. Quite happy how the egg sheet turned out. Simple sandwiches with grapes & raspberries. 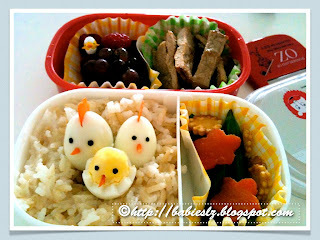 Nowadays, morning I'm always in a rush... Don't have the luxury to take my time to prepare cute bento for them. Pic was taken after their bubble fun and they were having their Macdonald dinner. Beanie is 17 months old! 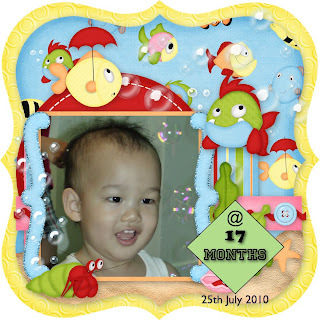 The highlight of the month would be he uttered his very FIRST 2 syllabus word, BABY! Little Beanie loves baby! Whenever he sees one, he excitedly point to the baby and say it. He does that too when he sees it on TV. ♥ He already has full set of teeth. ♥ He is very excited when he sees an animal or birds. He will point it out to me, "there!" 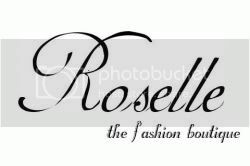 ♥ Nowadays, he follows what I do.... I use the magic clean everyday and he does that do. Love to see the way he is so focused when he does something. 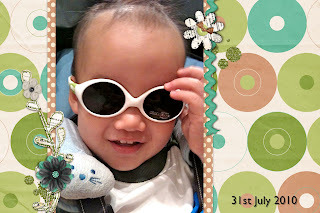 ♥ He likes to play with jiejie's Baby Alive, coz 'she' giggles! He shows affection to 'her', cuddling and patting 'her', as if trying to put 'her' to bed. So cute! ♥ Sometimes, if Beanie doesn't know how to play some of LZ's toys, he will sit with them and fiddle with their toys. After observing how they play, he is able to do it (most of the time). ♥ He still enjoys reading & scribbling. He often sees his siblings reading and when he sees that, he (usually) picks up a book to 'read' too. He 'upgraded' to drawing on our walls! We give him lots of paper to scribble but he still does that. ♥ Their computer chair is now Beanie's favourite chair. LZ use it to push him around the house FAST and he loves it! He sit on it (next to me) while I'm at the computer or he wants it when he watches TV. 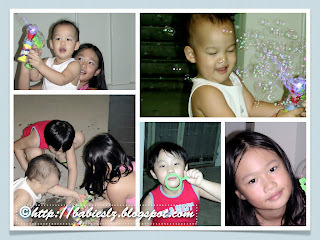 My little ones had fun today with bubbles. Beanie loves to play bubbles! Little Beanie was soooo full of energy before bedtime! He did this for more than 15 mins or longer (We didn't see the time). We didn't stop him coz we had so much fun watching him doing it. Love the part when he wiped his perspiration. Cute! My 2 older ones didn't want to appear in the video coz they were shy (one in the underwear and the other shy). His FIRST Tooth (yesterday)!! Yeah! Z waited a long time for it to happen. Why? 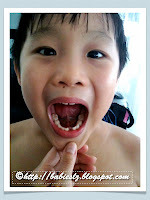 So that tooth fairy will visit him and he will get a $10, just like his sister! Unlike his sister, Z's tooth dropped on its own. It happened when he was having his meal! Z read a book on tooth fairy and has been talking about ever since. He asked jiejie and me many questions on tooth fairies. Now that L is older, she knows there is no tooth fairy at all and mommy was the one who placed the $$ under the pillow. We kept quiet about, we didn't want to dampen his excitement. Love the way how L played along with it, told him what they will do with the teeth they collected etc... She also quietly told me exactly where he placed his tooth. This morning, Z jumped with excitement when he saw the $10 note. "Mommy! Mommy! The tooth fairy came! My tooth is gone! See? She gave me the money!" In the box: Bagel pizza with sausages, quail eggs, rapsberries & champagne grapes. Bagel pizza? Or pizza bagel? I'm not sure too. What matters is that it is yummy! We had these for lunch too except Beanie. I still have threadfin the fridge so I cook porridge for him. The shaped quail eggs looked quite odd to be in this bento but I wanted to try out the stencil again. 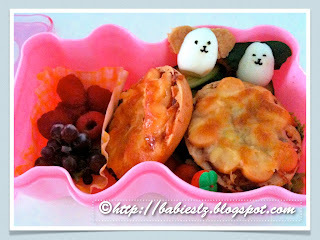 My girl didn't mind coz she got cute food in her bento. In the boxes: Brown rice, quail eggs, stir fry veggie, sliced pork, champagne grapes & raspberries. Z finished everything in the box, including veggie. Hmm.... 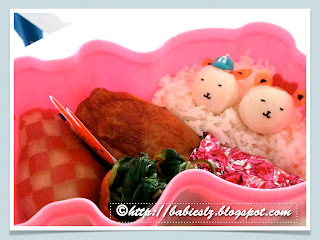 Cute bento does help I think. While I was preparing bento, Beanie passed me the bento bag! He knew what I need and where to take it from! Bravo my boy! He is one of my little helper now that we don't have a helper. We have sent our new helper back to the agent and decided NOT to have a live-in helper anymore. This new helper threw away my kids' graduation & annual concerts DVDs without asking me. SIX DVDs! I can't describe how upset I am..... She was with me for less than a week when this happened. To cut the story short, attitude problem was the main reason that we sent her back. 2 days after sending the 3rd maid back, hub found a note in our shoe cabinet for her. A man date her out!!!! My 2nd helper, is just as bad. She was dirty, lazy, etc... She took a whole day just to clean my house! Sometimes I wondered what she did when we were not at home. I do not need her to do all the cooking and she does not need to take care of Beanie at all. Many times, she was in daze. She is not new, with 2 years experience. The day the agent picked her up, we were shocked to find out she has been going out when she send my girl for ballet. After looking back at our experience with helpers, we have no regret sending them off. 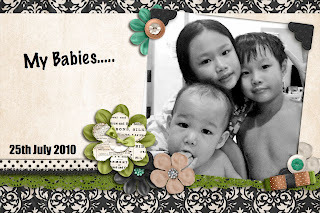 Yes, it will be tough for me to handle 3 kids on my own, cooking & chores. At least I don't feel stress anymore. Maybe it is too soon to say that but I hope things will work out fine for us. In the box: Baked drumstick, fishballs, rice, spinach rolled with carrots & waterapple. The bento looked so plain so I added 2 fishballs with features on them but I have no idea what were they! They looked so weird. To make me happy, my girl told me they looked like 2 cute little bears. 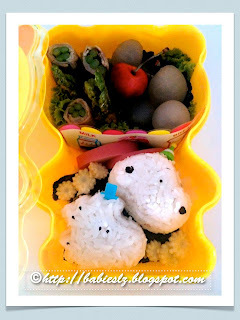 In the box: Snoopy & Woodstock shaped rice, baby corn, pork rolled with asparagus, Japanese fish cake, longan & cherry. I bought the snoopy set more than a year back and I forgot about it. If Beanie has not been ransacking my bento stuffs, I doubt I remember it. My girl can't tell it is snoopy till I told her. She was quick to respond when she saw I was a little disappointed. "Oh! Mommy! I forgot the name of the character so I that's why I said I don't know." My sweet little girl. Think I used a box that is a little too big.... Tried to put in more food to fill up the space and end up L can't finish everything inside the box (except the rice).